Layer 1 (White) - 111mm x 155mm - 4⅜" x 6⅛"
Layer 2 (Glitter Card) - 124mm x 168mm - 4⅞" x 6⅝"
Layer 3 (White Embossed Card) 168mm x 187mm - 6⅝" x 7⅜"
Whenever we look at something, no matter what it is, we are affected by its colour. Colour invokes feelings in all of us and affects what we think about what we are looking at. This is what happens when we look at a card or mixed media project, whether you realise it or not, the colours used can affect whether we like it or not. Interestingly, when we look at craft things to buy the colour of the example we see can actually stop or encourage us to buy it. So next time you go somewhere and are thinking about buying something see if you can just look past the colour and when we make handmade projects it can be very useful to know what sort of colours the recipient likes and forget what we like. Here are two cards used making the same die and the same media - glitter. Some people won't like glitter whatever it's colour so possibly won't like either of these cards. Some people feel that Christmas should be a traditional time of year so won't like a contemporary look and vice versa. 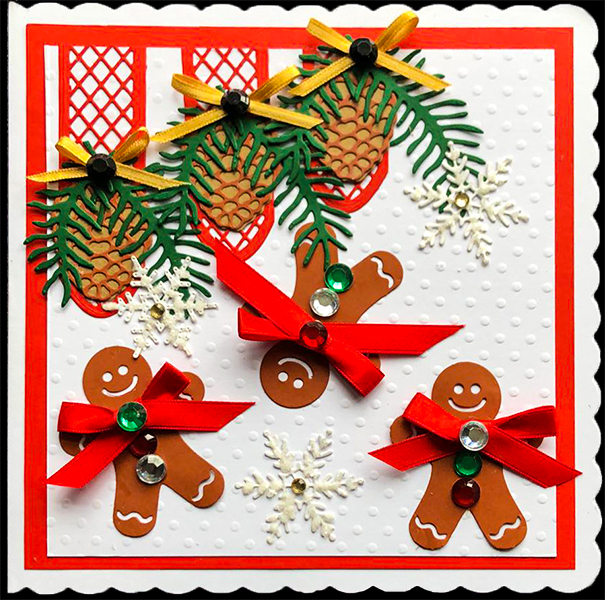 Both cards are the same size and cut with the same die - Creative Expressions Festive Foliage Frame. Cut 3 pieces of card and a piece of double sided tape sheets to the size of your die, approx 12.1 x 14.3 cm ( 4 ¾" x 5 ⅝"). Attach the double sided adhesive to one of the pieces of card. Cut the die out of the card that has the double sided tape attached to it. You might need to run the die though your machine a couple of times or use a shim to make sure the die cuts through the card and adhesive. Carefully pop out all the negative pieces of the die cut and put them aside, you will be using them later. Put the die cut onto a craft sheet or large piece of paper and remove the double sided sheet backing, this will reveal the sticky tape. Sprinkle glitter onto the die cut, pressing slightly and ensure the entire die cut has glitter on it. Burnishing the glitter will help it stick to the tape. If you want to add a rainbow effect then peel the backing off gradually and add each colour separately. Cut a piece of glitter card 1.3cm ( ½") wider and higher than your die cut - approx 13.4 x 15.6cm (5 ¼" x 6 ⅛") and using wet glue stick the die to the centre of the glitter panel. 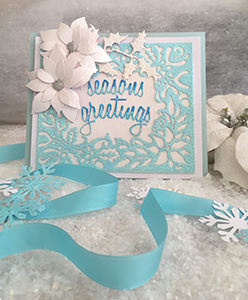 Cut out a greeting from glitter card and colour it with permanent markersYou can then embellish the card with further die cuts or embellishments, as I have done with the poinsettia and holly, then attach all the panels to a card base. Cut a panel from gold card 17.8 x 14.6cm (7" x 5¾")Adhere the die cut centrally on the gold panel. Get all the negative parts of the die cut you put aside earlier and sort them into groups that you want to all be the same colour. Get out your first colour and put a little pile into a container or on a non stick craft sheet. Pick up the pieces and remove the backing paper then drop them into your glitter pile. Using tweezers move the pieces around until they are all covered with the glitter. Continue to do this with each of the different colours. Using tweezers pick up each of the glittered pieces, one at a time, and put some wet glue on the reverse. You can then fit each piece into the correct space on the die cut. I have done it this way as it raises the glittered pieces slightly above the surface of the card adding texture and dimension. Continue to do this with all the different coloured pieces. Adhere centrally onto the gold panel. 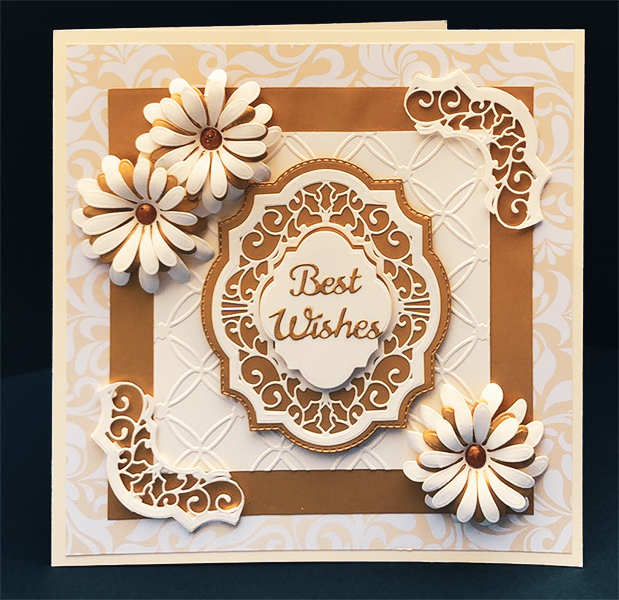 Cut a sentiment from gold card and adhere to the front of the centre panel of the die cut. 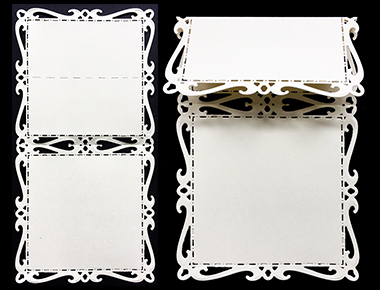 .Attach all the panels to a card base. The card base was made from a 12" x12" (305mm x 305mm) piece of Crafters Companion Snow White Hint of Gold card. Score the card from one end at 3" and 6" (76mm x 152mm) and fold and burnish the folds well with a bone folder. The edges of the "gates' were rounded. All the edges of the card were edged with Encore Ultimate Metallic Gold and dried with a heat gun. 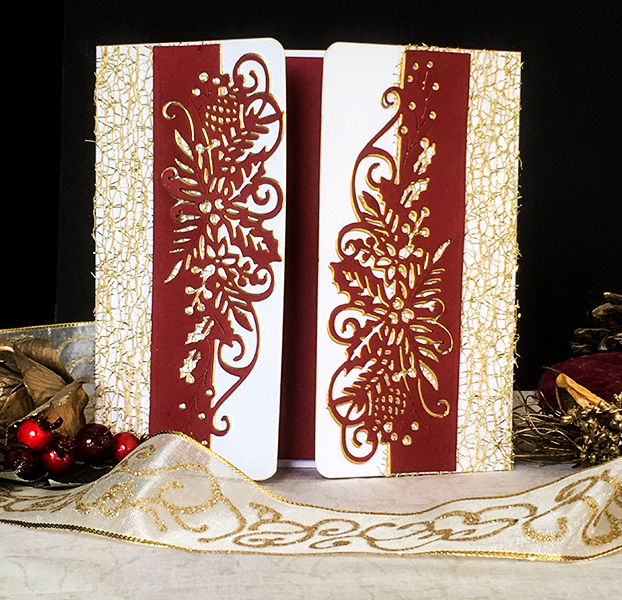 Cut two of the Papercuts die - Holly Berry Edger in red card and two in gold card. Line up one red and one gold diecut on top of each other and then move the gold die cut slightly down and slightly past the fancy edge to create a shadow effect. Turn the second pair of diecuts 180° and repeat as above. 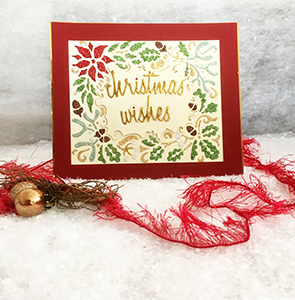 Attach a piece of ribbon or mesh to the outer edges of card. With this card the ribbon goes under the edge of the diecut to the straight edge so that it shows beneath the diecut. Attach the pairs of diecuts so that the fancy edge is close to the edges of the 'gates'. If using ribbon or mesh, glue is easy to use and usally stays in place. Add a piece of contrasting card on the inside and add your message. Layer 1 is 7 ¾" (197mm). Layer 2 is 7 ¼" (184mm). 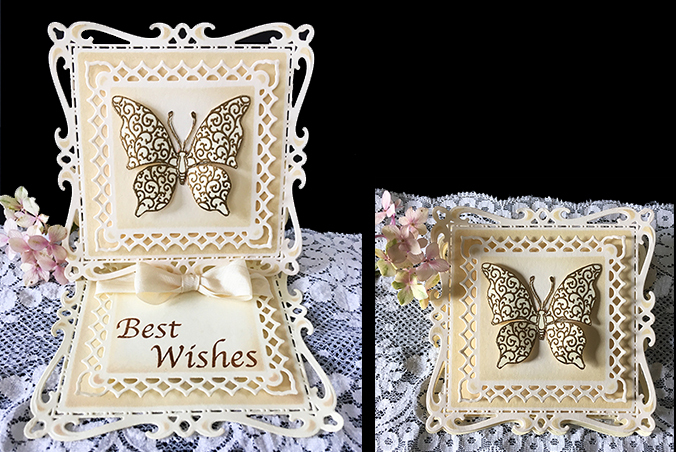 Layer 3 is 6 ¾" (171mm) and embossed with Crafts-Too Embossing Folder A4 - Fancy Lattice. Stick the 3 layers centrally to base card with glue or mount with sticky pads. 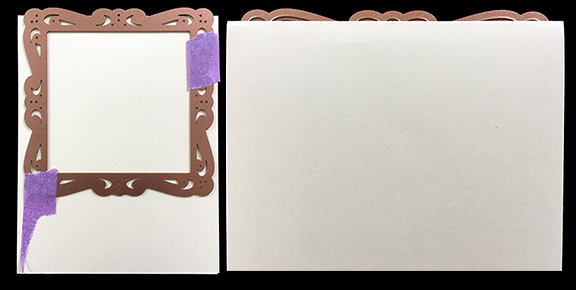 Cut out the three elements of Oval Layers Frame (not the lattice die) in coloured card. Cut one extra layer 2, (the holly design). Trim one of the holly design die cuts to create the corner embellishments and stick to corners of layer 2. Cut Presscut Best Wishes die in contrasting colour to layer 3 and stick to layer three. Layer all three elements together using glue or foam pads. Cut 3 of the largest complete flower dies and 6 of the smaller complete flower dies from Leane Creatief Multi Flower 009 in coloured card. Layer 1 large and 2 small flowers to create the three flowers . Rotating the top two layers gives a more natural look. Put a dot of Cosmic Shimmer Coloured pearlescent PVA glue to the centre of each flower and allow to dry. Mount the Holly Lattice elements to centre of card. Place the three flowers around it and stick to layers 2 and 3. This is a basic easel card using partial die-cutting to create an interesting shape. 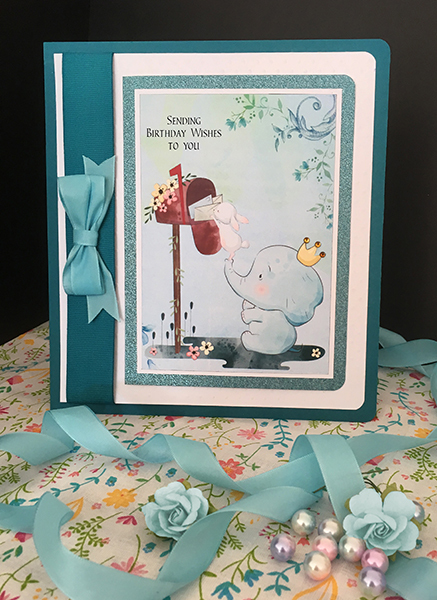 Choose any frame die, Sharons Card Crafts - Square Multi Layer Frame is very similar to the one we have used. Cut a piece of card that is twice the height of your die plus 1" - 25mm and the width of your die plus 1" - 25mm. It is a good idea to use card that is slightly larger, although you don't have to, so you have some 'wiggle' room. Place the top cutting edge of the die slightly above the fold line as in the picture below and run through your die-cutting machine. When you remove the card from the die you should see that the two pieces of card are still connected, creating a hinge, this is where your card folds. Open out the hinged die cut so that the top shape is showing the 'wrong' side of the die and score and fold across the top shape as in the picture below. Colour the bottom layer using the die as a stencil using Tim Hotz Distress Ink. Cut out another complete die cut (not off the edge) and colour in the same way. Cut and colour another 2 layers. One to place on top of the complete die cut and another to place on the bottom of the easel. Stamp Sleek Designs Small Scroll Butterfly on a piece of card with Tim Holtz ink and dry with a Heat Tool. Use an anti static pad over the entire piece of card. Put the stamped butterfly into a Stamp Positioner, line up the cleaned stamp onto the stamped image and then close stamp postioner lid to pick up stamp. Using Versamark overstamp the existing butterfly image. Remove image from stamp positioner and cover with Wow Metallic Gold Rich Pale super fine embossing powder, tap off excess and heat until melted. Cut out the butterfly and adhere to the 2nd layer using either glue, double sided sticky tape or foam tape. Attach butterfly and 2nd layer to complete die cut. Take the completed die cut and lining up the side and bottom edge, adhere it to the folded part of the easel card base as shown in the picture below. 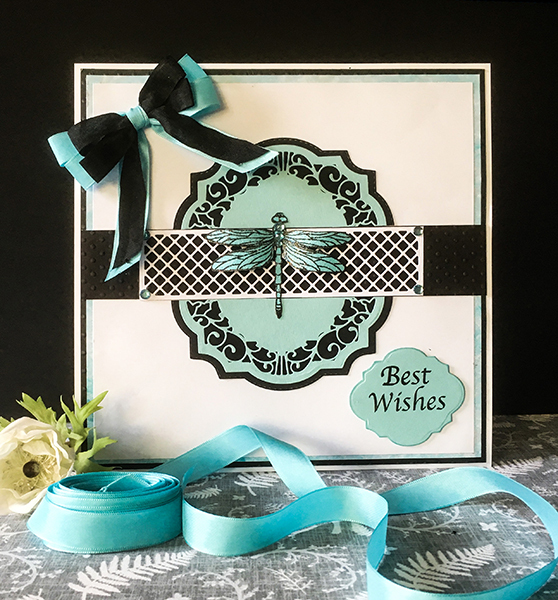 Stamp Sleek Designs Best Wishes using Tim Holtz ink pad onto the 2nd coloured layer using the Stamp Positioner. Place the stamp with the Wishes part at the bottom left of the layer and pick up with the stamp positioner, ink and stamp. Remove and clean the stamp and place the Best part of the stamp above and to the left of the Wishes and pick up with the stamp positioner, ink and stamp. Make a double bow with long tails with ribbon and attach near the top of the layer you just stamped with foam tape. This will be the 'Stop' for your easel card. Wrap and attach the tails to the back of the layer. Attach the completed second layer onto the base of the easel card and your card is finished. Matt and layer red card 7.5" x 7.5" and black card 7" x 7" onto the base card using double-sided tape. Select two or three shades in the colour you want your Elephant. 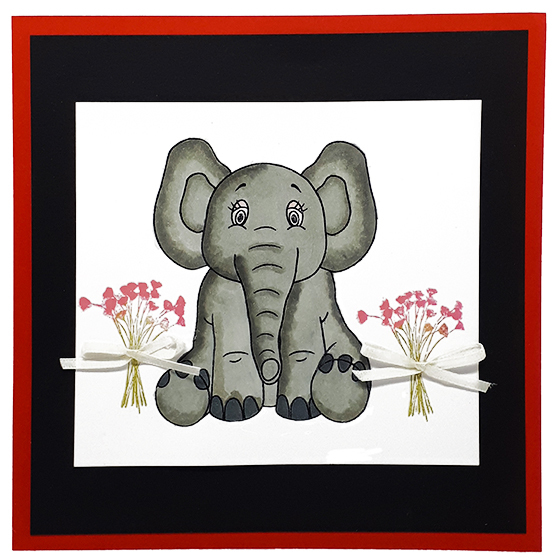 We chose grey but you could have a pink or blue elephant, or any colour you like! Colour the whole image with the lightest shade. Now go back over the whole image with the lightest shade. This will help blend the inks and soften the effect. This card is quite large - 8 " x *8" (203mm x 203mm) - so we made our own base card. Layer three different coloured squares of cardstock, each 1/4"/6mm smaller than the previous one, onto the base card. 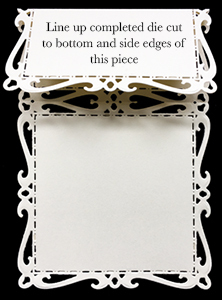 Cut out the three elements of Holly Lattice Frame, not the lattice die, in coloured cardstock. A piece of lattice cardstock from stash was then layered centrally on the black strip and self adhesive gems added to each corner. The black strip was then stuck to the middle of the card and the two cut die elements mounted centrally either side of the black strip. The last layer of the die was stamped with Sleek Designs Best Wishes with Versafine Onyx Black and mounted with foam tape. A double bow was then added to finish.